Gallogly photo by James Hoggard. At their annual gala last week, the Western New York Land Conservancy announced their latest conservation success — the new Margery Gallogly Nature Sanctuary in the Town of Grand Island. 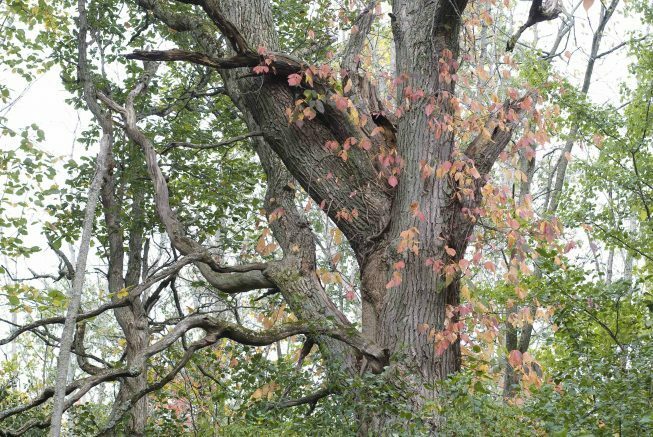 At 145 acres, this remarkable oak and hickory forest is one of the largest, undeveloped, privately-owned properties left on Grand Island, and Grand Island has some of the largest remaining forests in the entire Niagara River watershed. Both Big and Little Sixmile Creeks flow through this unique forested landscape to the Niagara River. Here, vast wooded wetlands remain from the last glaciers, providing a haven for migratory songbirds in the treetops and blue-spotted salamanders on the forest floor below. Over the last 18 months, the Land Conservancy raised $804,000 to purchase the property, manage the land long-term, restore wildlife habitat and create a new trail system at this fascinating forest on Whitehaven Road. Generous funding for the project was contributed by the Niagara River Greenway Ecological Standing Committee, the Gallogly Family Foundation and the Land Trust Alliance’s Conservation Partnership Program through the New York State Environmental Protection Fund, as well as individual donors. While the sanctuary is not yet open to the public, the Land Conservancy hopes to begin trail work next spring, which may take a year or two to complete. Once complete, the sanctuary will be opened for people of all ages to enjoy year-round outdoor recreation like hiking, snowshoeing and cross country skiing. Residents and visitors will be able to take a peaceful walk on nature trails, view colorful songbirds during migration, and witness the frenzy of salamanders and frogs as they emerge each spring. All of this will be available less than a mile from Grand Island’s new welcome center and just a short drive from both Buffalo and Niagara Falls. The Land Conservancy would love to conserve more land on Grand Island, so if you are interested in protecting land you own, contact them at (716) 687-1225 or info@wnylc.org. You can also support the Land Conservancy’s work by making an online donation at wnylc.org or by sending a check to the Western New York Land Conservancy, P.O. Box 471, East Aurora, N.Y. 14052. The Western New York Land Conservancy is a regional, not-for-profit land trust that permanently protects land with significant conservation value in Western New York for current and future generations. The Land Conservancy envisions a future in which open spaces, working lands, wildlife habitat and scenic beauty are cherished and protected as part of the landscape and character of Western New York. The Land Conservancy is accredited by the Land Trust Accreditation Commission and is one of 1000+ land trusts nationwide, including 90 in New York State. Land trusts have protected 56 million acres of land. For more information on upcoming events, volunteer opportunities or the mission of the Land Conservancy, please call (716) 687-1225 or visit www.wnylc.org. Be the first to comment on "Land Conservancy creates iconic Grand Island nature sanctuary"